This is the fourth in Wilkie Martin’s unhuman series of cozy comedy crime fantasies. As most of my regular readers know, I absolutely hate getting a book to review and finding out that it is 2nd, 3rd, or 4th book in a series. 9 out of 10 times, I get so lost that I just want to put the book down and DNF it. But, I usually push through the book and I usually am totally confused about what is going on. Luckily, with the last few books that I got and were part of a series, they were pretty easy to follow and gave information about the earlier books in a way that didn’t underwhelm or overwhelm the current book. 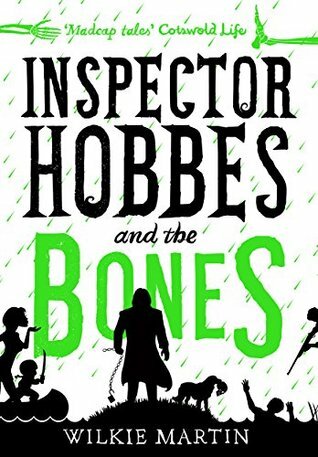 Happily, I can group Inspector Hobbes and the Bones in with them. Now, this is a book that is set completely in England and there is a ton of dry English humor (which I love) and a lot of English vocabulary. Luckily, my Kindle’s English (not American English, English English…lol) dictionary was downloaded because I had to use it a few time. Not that it took away from the story but it did add some time to my reading. Not complaining, though, because I did learn some new words. This book is a paranormal mystery. Now, if I hadn’t of read the blurb, I wouldn’t have believed the paranormal part of the book. Trust me, it’s in there but the author chose to focus more on the mystery part of the book with the paranormal part really not coming into play until the last half of the book. There are paranormal elements in the book (the vampire and Hobbes’s habit of eating bones are two) but the focus is on the many mysteries that Andy and Hobbes happen upon. Now speaking of the mystery part of the book, I loved that the author was able to handle a few mysteries at once and then was able to merge them with the main storyline. I have read other mysteries that attempted to do that and then they just lose track of the sub-storylines and those are never resolved or merged with the main storyline. Again, something else I really liked about this book. Andy came across as an idiot. I mean, how can someone get into that many predicaments and how can someone be that unaware of their surroundings? Plus, he also had a huge knack for ticking people off and just plain doing/saying the wrong thing. I mean, who would pack chocolate in their wife’s luggage when she was going to a dessert and then wonder why she was so upset because ants bit her and her clothes were ruined. His bumbling antics really didn’t do it for me in the story and I was truly waiting to see if he was going to get knocked off. Hobbes, however, I was fascinated with and I really wish that more was revealed about him other than he policed the supernatural. I mean, he ate bones and according to Andy, he had a ferocious temper, unlike anything that he (Andy) had ever seen before. Also, he never seemed to age. So what is he? Now, this is where I wish I had read the first 3 books. I am sure that more insights into who/what he is in there. The secondary characters were written awesomely too. From the little person who moonlighted as a ninja (OMG, did I die laughing during that scene) to the bar owner who had a temper and liked to fight to the vampire banker to Hobbes housekeeper and dog to the literal man killer and her cousins…..I absolutely loved them. Honestly, a good book has excellent secondary characters and this book definitely did. I will say that the end of the book did surprise me and the mysteries were solved. There were really no twists, which for once was refreshing. I also liked that while those storylines ended, the book was left open for potentially a 5th book. Why: This was a great mystery with paranormal elements. I was genuinely kept guessing about who killed the bodies that Andy and Hobbes found. I was also guessing that the other sub-storylines.